Antivax ads, real skeptics, Arsenic, agnostic dad, precog, Wikileaks, Godzilla and more! Anti Vaccine Propaganda at your local theater? - Commercial got cancelled. Are you a real skeptic or just faithing it? - I believe I’m a real skeptic. Newly Found Arsenic-Based Life Form - But flaws found in NASA study. Still interesting though. Parent denied custody - Because he is agnostic?! Study suggests precognition… - Replications of the study suggests: Not. Wikileaks. Good thing or bad thing? - A bit of both, probably. …To begin with, let’s get things straight and admit up front that Godzilla is not a real animal, nor was it ever. It’s an unfeasibly big late-surviving dinosaur (belonging to the hypothetical taxon Godzillasaurus, according to some), mutated by radiation, with a radioactive heart. 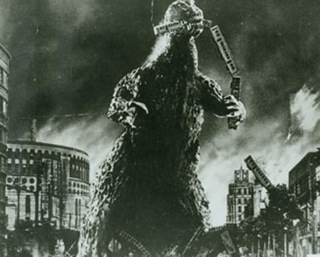 Godzilla is virtually impervious to other gigantic monsters, and also to robots, artillery, laser blasts, lava and fire. Not real. Sorry about that. But by posing questions about fictional entities we can still learn stuff, and you may be surprised to learn that Godzilla has, on occasion, been discussed semi-seriously by various biologists and palaeontologists. Ok, that won’t surprise you if you already know anything about Godzilla, but what the hey. Naish goes on to explain the biology, anatomy and physics of my favorite atomically mutated really really big rubber suited fire breathing reptilian monster. With lots of photos, including anatomical drawings of Godzilla and lots of links to other important things to know, including more anatomical drawings and more on the biology of the big fellow. …Anyway, Tracy has been kind enough to let me use his drawings here. Here they are, with a bit of commentary. Heh. This is science folks! And it goes on like this with more drawings and a scientific lowdown on the imposter Zilla’s anatomy. Godzilla fan or not, this is some cool stuff! Atlantis — True Story or Cautionary Tale? Yeah, but will it float? There were 7,394 daily visitors this week. There were 29,010 daily visitors in November, 2010.